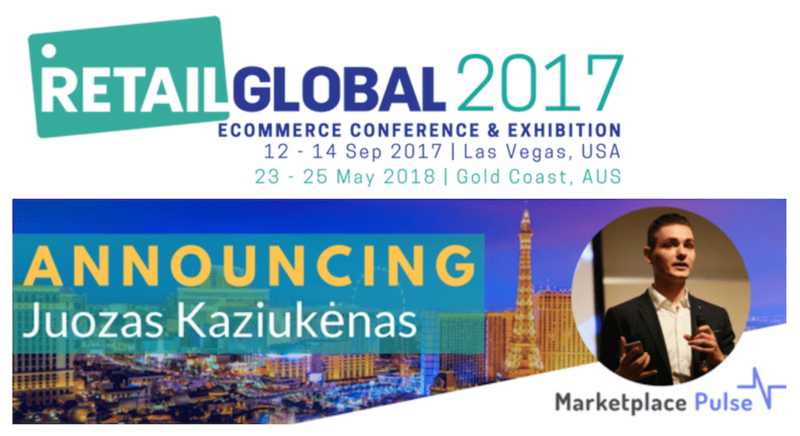 Retail Global announced that Marketplace Pulse founder Juozas “Joe” Kaziukėnas will take the stage and present a keynote at Retail Global Las Vegas 2017. Retail Global Las Vegas 2017 conference is set to happen in Rio Hotel & Casino in Las Vegas, NV on September 12-14th. Joe’s keynote, titled “The Future of Marketplaces”, will focus on the trends in leading global marketplaces. It will build on top of our published articles and research, and also include exclusive findings. Amazon launched their marketplace 17 years ago in 2000, and since then it has grown to be a big opportunity for new sellers and brands. However it has continued to evolve and change. Thanks to our data collection and analysis efforts we’ve been able to gain bird’s-eye view of the market. We think we see patterns in the data, and can spot what will happen next. Retail Global had its first event in Australia 12 years ago, and has since launched their event in the US. This year’s event will be the third. The conference itself entails workshops, keynotes, panel discussions, and exhibition booths. Speakers include Suzanne Miglucci, Present & CEO of Charles & Calvard; Lee McCabe, VP/GM, North America at Alibaba Group; John Kelly, Head of Sales at eBay Marketplaces; Richelle Carrey, Anchor, Al Jazeera - MC; Jim Banks, CEO, Spades Media; Britney Muller, SEO & Content Architect, Moz; Dr Debra Jasper, Founder, Mindset Digital; and many more. Over 70 speakers will present over three days. Tickets can still be purchased on the Retail Global website. Use the code MARKETPLACEPULSE to receive $100 discount. For your chance to Win 2 tickets to Retail Global enter here.